French Bossa Nova enthusiasts release another batch of reimagined new wave covers. Even if I hated their music, I would have to give Nouvelle Vague props for their name, which means "new wave" in English and "Bossa Nova" in Portuguese. Fitting, since they are a French band that covers new wave songs in a Bossa Nova style. 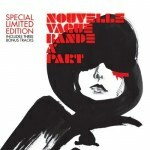 "Band" might be a stretch, since Nouvelle Vague is composed of two French producers, Marc Collin and Olivier Libaux, and an exhausting list of ethereal chanteuses. Collin and Libaux's strategy is the same on this as it was on the band's first album: the singers have supposedly never heard original versions of the songs they're covering. This is a clever move, because we can never really accuse them of trying too hard to sound like anyone. Though Nouvelle Vague comes off as just an amusing novelty act, listening to this album as objectively as possible can reveal hidden depths in these songs. What sets Nouvelle Vague apart from your average cover-band-with-a-twist is that only about half the songs on this record are well known. Standbys like Blondie's "Heart of Glass" and U2's "Pride (In the Name of Love)" stand alongside unknowns like Lords of the New Church's "Dance with Me" and Heaven 17's "Let Me Go". While this allows the band more creative leeway -- in addition to giving them more cred -- it is admittedly a little less fun than hearing a bouncy Phoebe Killdeer warbling Billy Idol's suggestive "Dancing with Myself". Some of these tunes sound great as Bossa Nova, but the main problem with those that don't is the sluggish torpor Nouvelle Vague seem to inadvertently exude. The dreamlike quality of the vocals can be appropriate and haunting, but these songs still need a little kick. The album starts off with Echo & the Bunnymen's "The Killing Moon", a creepy song that vocalist Melanie Pain pulls off with the appropriate detached anguish. More impressive is "Ever Fallen In Love?" (originally by the Buzzcocks), which works surprisingly well as an up-tempo Bossa Nova number. "Ever Fallen In Love?" is the only well-known song on Bande a Part that transitions so seamlessly to Bossa Nova. While "Dancing with Myself" is always fun, it clearly doesn't work too well, and "Heart of Glass" and "Pride (In the Name of Love)" fall flat. It is interesting, still, to see the different perspectives that can be gained from a simple genre switch. I am always interested in hearing songs performed in vastly different styles, as it shows the versatility of the lyrics, giving them a different, sometimes more poignant, meaning. Despite these occasional missteps, the album is enjoyable. In their best moments ("Dance With Me", Yazoo's "Don't Go", and "Let Me Go", which is performed by Nouvelle Vague's most charismatic vocalist, Siija), Nouvelle Vague is a fun, clever band to have on the stereo so your friends can ask, "What is this?" They don't really leave a lasting impression, but then again, they are less of a band and more a project, and there isn't too much here to analyze. Just sit back with a fruity drink and make your memories of the 80s a little less about mascara and little more about sunny, silly music.